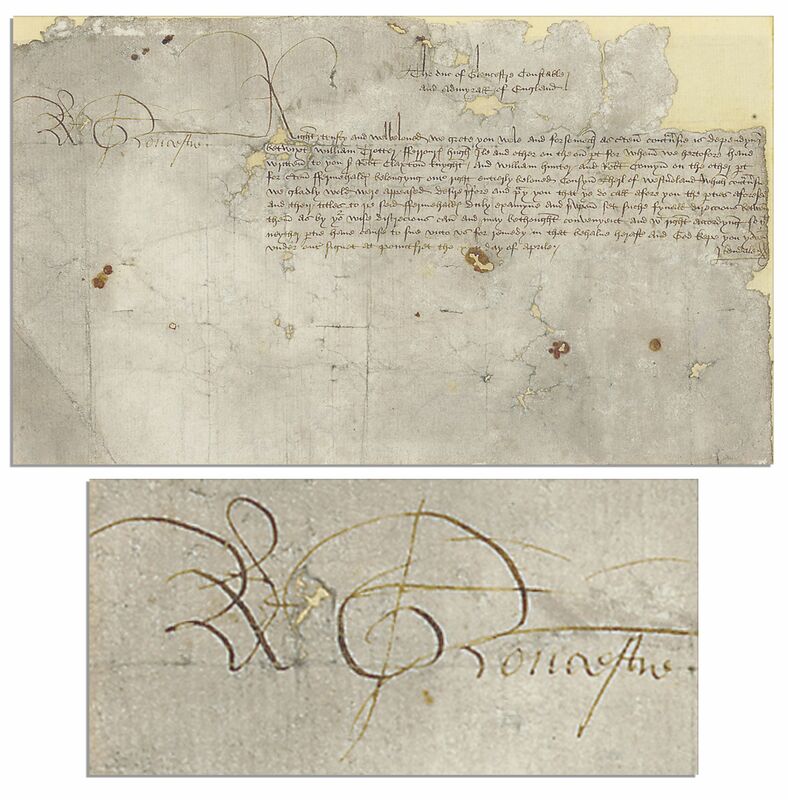 Richard III signet-sealed document signed ''R. Gloucestre'' as Duke of Gloucester, one of less than a dozen such documents signed with the others residing in public institutions. Richard's brother, Edward IV, appointed Richard as Lord President of the Council of the North, which sought to exert greater governmental control over Northern England. Document is dated by title donned on Richard as ''Constable and Admyral of England'' instead of ''Great Chamberlain,'' which dates the document circa 1473-77. As Duke of Gloucester in his early 20's, Richard III was given many responsibilities by his brother, becoming a powerful landowner and political force to be reckoned with in the north, further establishing his future reign as King of England. Document illuminates his growing power as he hereby intervenes in a land dispute between Ralph Neville, 2nd Earl of Westmorland and some of his tenants. Countersigned by the Duke's secretary, John Kendal. 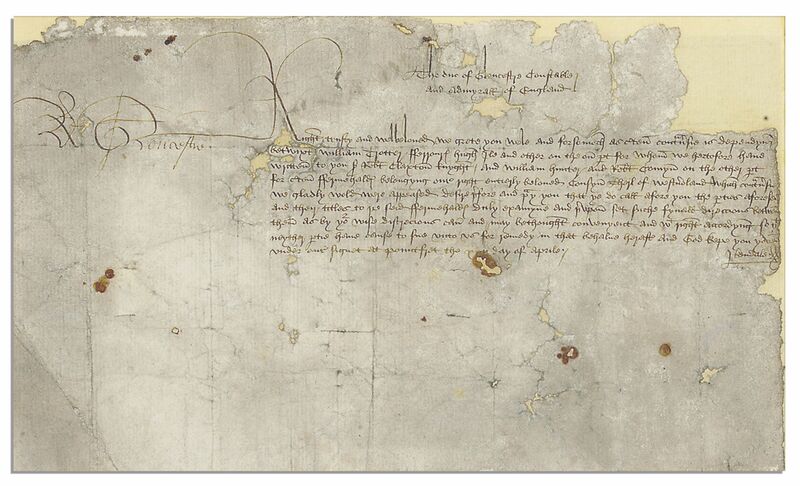 Document is addressed to Sir Robert Claxton, William Claxton, Richard Bainbridge, ''and other of the 'Counsell of our right entierly beloved Cousyn Therl of Wesm[or]land', Pontefract, 22 April n.y. [1473 or 1476-77]''. Reads in part: ''c[er]ten cont[ro]v[er]sie' between William Trotter, 'ferrour' ['smith'? ], Hugh Ile and others on the one hand and William Hunter and Robert Comyn on the other, concerning leaseholds belonging to the Earl of Westmorland. He writes now to a larger group of Westmorland councillors, asking that they examine the petitioners and settle the dispute according to their own discretion, so th[a]t neyther p[ar]tie have cause to sue unto us for remedy in that behalve heraft[er].'' Measures 11.75'' x 7'' on one page. Framed to an overall size of 18.5" x 14.25"; frame has a drawer that pulls up from the top edge holding a transcript of the document and a biography of Richard III. 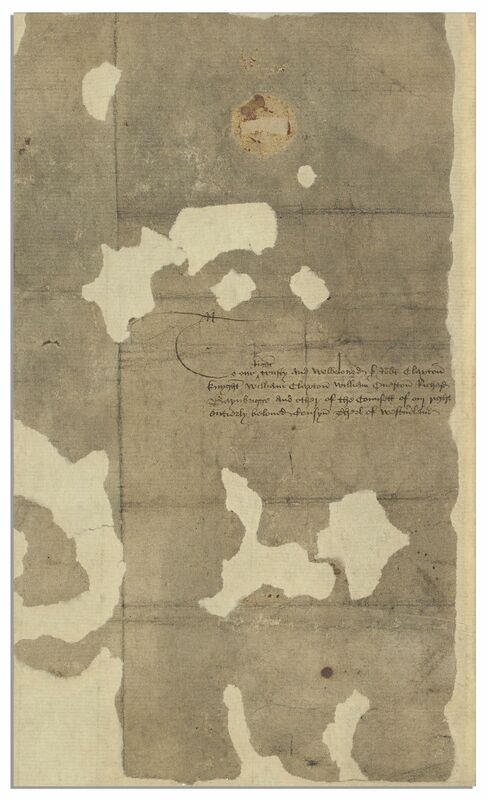 Document has been archivally restored, though still has paper loss to right side and various holes and chips throughout. Overall very good condition for such a preserved document. 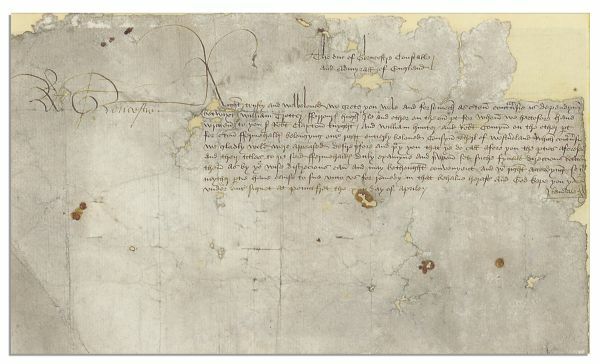 Document is exceedingly rare, one of only three documents signed by Richard III to come up for auction in the last 30 years. Auction closed on Tuesday, April 2, 2013.